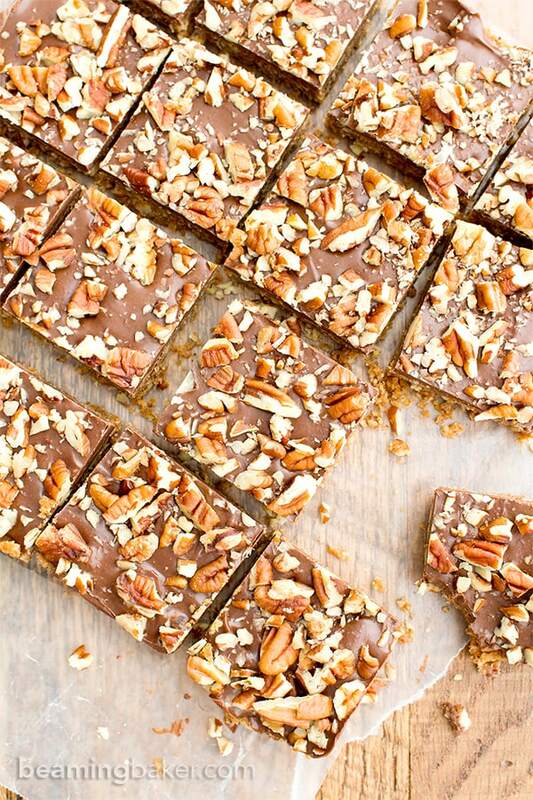 No Bake Paleo Chocolate Pecan Bars (V, GF, Paleo): a 5-ingredient, no bake recipe for deliciously textured pecan bars topped with a thick layer of chocolate and nuts. Paleo, Vegan, Gluten Free, Dairy-Free. Before we get started today, I just wanted to say thank you all for the amazing birthday wishes. 🙂 It was really wonderful and heartwarming to receive your kind words. <3 All the hugs, high-fives, and maybe, just maybe, some big plates stacked with warm cookies (and birthday cake) to you. It’s official, fall is here! Wait a minute, I’m a bit behind again, aren’t I? What I meant to say was… it’s official, Thanksgiving madness is upon us! We made it through that rough patch of letting go of summer, we drizzled our way through Halloween, and, now, we are finally in that cozy, warm spot before the winter holidays. Leaves are turning all the beautiful colors of pumpkin bread (and chocolate pumpkin bread!!! Okay… brown leaves heh heh), candy red apples, and caramel spice lattes… um, I mean, natural, non-food related colors of fall (yeah, right). And here we are! In case anyone noticed, I’ve gotten into a mood. More specifically, the pecan mood. Could there be a tastier mood? Okay, there is peanut butter and chocolate, coffee and coconut and all kinds of other flavor-ingredient moods I have to stop talking about or else I’ll eat my computer. But, ya know, it’s a pecan-scented/stuffed/topped/chopped mood ‘round these parts. First there was the double chocolate pecan brownies. Yep, with plenty, plenty, and more plenty of drizzle. Then, there was the no bake pecan pie bites. 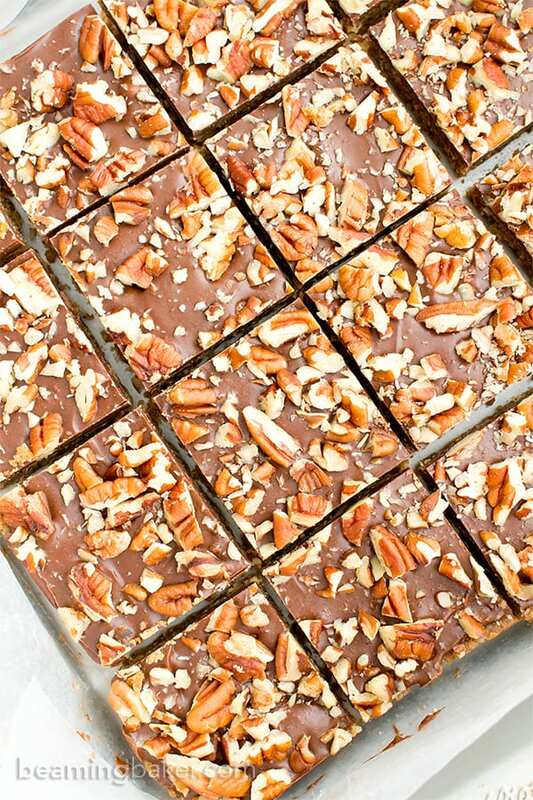 And now, without further ado, a most stunning addition to the Pecan Collection of ’16: No Bake Paleo Chocolate Pecan Bars. Do you love pecans as much as I do? Do you kinda think they taste like they’re already coated in something sweet and delicious, like coconut sugar, without even being coated in something sweet and delicious, like coconut sugar? Snack-packed care packages… Hmm. I kinda like the sound of that. Wait, what was I saying? Right. Well, I was whipping up another batch of those pecan pie bites and I started thinking, what would happen if I just poured the entire lot of it into a pan? Then, combine some of that deliciousness with the amazing chocolate topping from this recipe? It could go one of three ways: 1) terribly awry for no good reason at all. 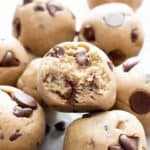 Don’t even get me started on the shenanigans that arose from trying to make my no bake pumpkin chocolate chip cookie dough bites into truffles (simple?? Not so much.) 2) Fairly mediocre-ly. Yes, mediocre-ly. In which case, it totally would not warrant the joy/trouble of blending up dates, almond butter and pecans (some of the most precious, delicious ingredients ever, amiright?). 3) Stunningly, fireworks-shooting-off-into-space, take the day off of work and traipse over all manner of apple-green hills while singing like Zac Efron in that one music video that ALWAYS makes Erik and me giggle because these are that good, GOOD. Someone call Zac (why yes, we’re on a first-name basis) and tell him to put his singing shoes on. 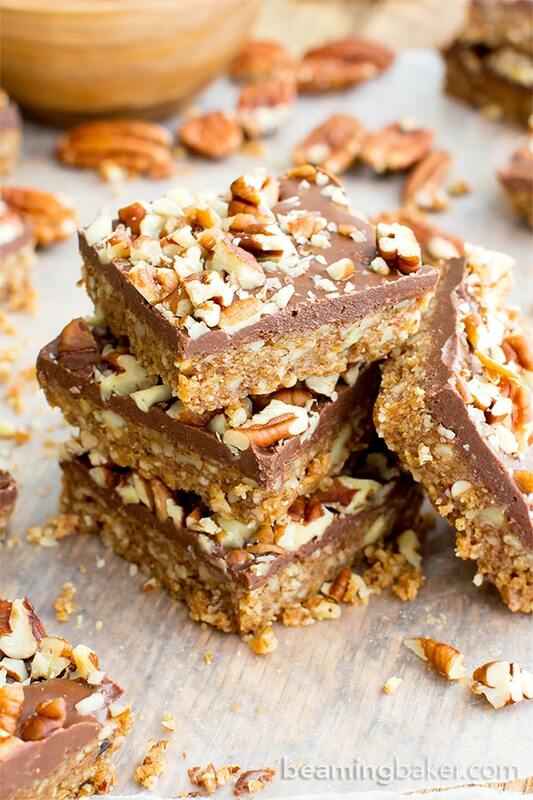 Because these No Bake Paleo Chocolate Pecan Bars are IT. IT = So. Ridiculously. Good. And before I start telling you all about how amazing they taste, let me just first say: they do not require refrigeration. Is anyone else as excited about that as I am? No refrigeration. Duuuuuuuuude. I mean, you totally can refrigerate these, if that’s what floats your (obviously cool in many ways) boat. But they just don’t! In fact, the texture of these is actually better if you leave them out at room temperature. Unless you’re the type to enjoy frozen brownies? No judgments—I’ve been known to really enjoy frozen cups of all shapes and sizes (okay, well, just sizes cause: cups. Ahem). Frozen can definitely make the enjoyment time last longer, but there’s just something to be said about a no bake bar that can withstand the test of room temperature. When I was testing these bars at different temperatures—why yes, that does sound a tad crazy—I wanted to make sure they’d keep at all the degrees. I trial tested one container of these No Bake Paleo Chocolate Pecan Bars in the fridge, one on the counter and one in the freezer. I found that the one at room temp had the tastiest texture. The chocolate topping was firm, but delightful to bite into, like soft fudge. 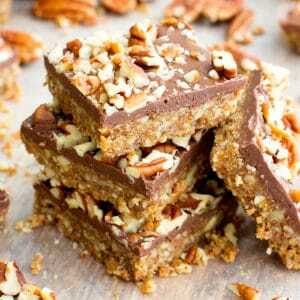 And the pecan bars held together, with this perfect sweetness and scrumptious texture. Alright, maybe I’m rambling. Okay, I’m definitely rambling. But seriously, these bars are THAT good. 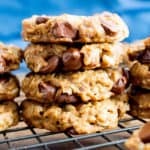 I’ll save you the displeasure of reading like 10,000 more words about these no bake treats, and just shower you with the features bullet points that I so often like to do. 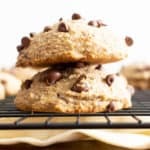 🙂 Also, before I get to THE list, can I just say: these paleo chocolate chip muffins from the very talented Chrystal at Gluten-Free Palate look amazing! What’s the weather like where you live? Does the change in seasons make you crave anything special? Line an 8-inch square baking pan with parchment paper, greased foil or wax paper. Set aside. Make the pecan layer: Add dates and almond butter to a food processor. Blend until you get a somewhat cohesive, sticky and crumbly mixture, like chunks of wet sand/dough. This will take about a minute. Scrape down the sides of the processor as needed. Add in 1 cup pecans, vanilla and salt. Blend until the pecans are fully-incorporated and you get a soft, crumbly mixture. It’s ready when you can pinch the mixture between your fingers and it holds together. Add in remaining ½ cup pecans. Pulse just a few times until incorporated and pecans are chopped, with medium-small pieces still visible. Pour this mixture into the prepared baking pan. Press down and smooth into an tightly-packed, even layer. Make the chocolate layer: Use the double boiler method or the following. 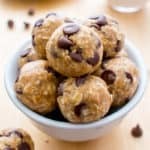 In a medium, microwave-safe bowl, add Chocolate Layer ingredients (1/2 cup chocolate chips and ¼ cup + 1 tablespoon almond butter). Heat in 20-second increments until softened and melted. Stir until smooth. 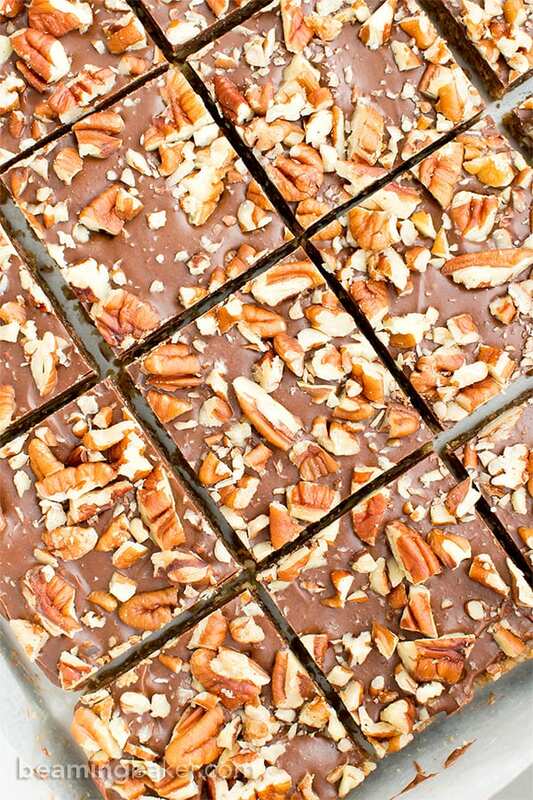 Pour this chocolate mixture over the pecan bars. Using a rubber spatula, smooth into an even layer. Sprinkle ¼ cup chopped pecans evenly over the bars. Press pecans gently into the chocolate layer. Freeze for 20-30 minutes. Remove from freezer and slice into 16 bars. Enjoy! Storing instructions below. 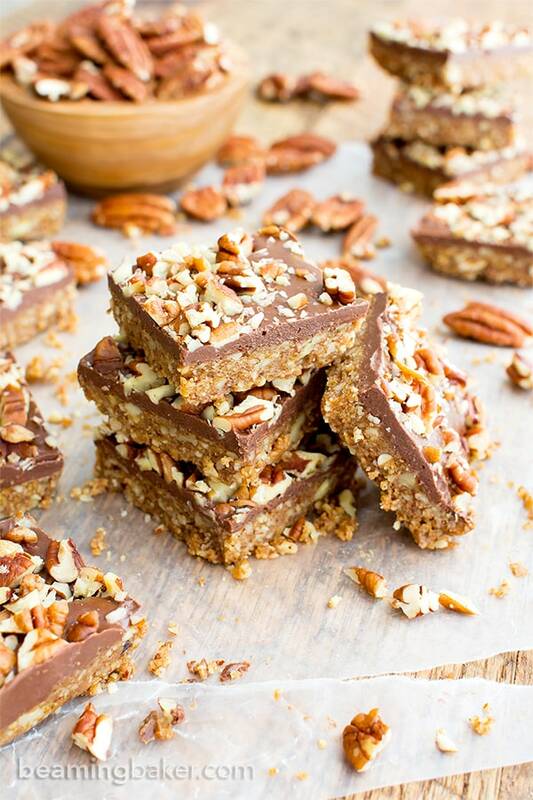 - Adapted from my No Bake Pecan Pie Bites (Vegan, Paleo, Gluten Free, Dairy Free) and my Chocolate Peanut Butter Rice Crispy Treats. - Storage notes: Store in an airtight container in the refrigerator or at room temperature for 1-2 weeks. - Freezing instructions: Store in an airtight, freezer-friendly container in the freezer for up to 1 month. 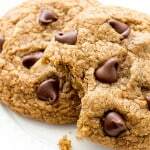 - Fall recipes (v, gf, df): pumpkin bread, pumpkin chocolate chip muffins, caramel apple tartlets, double chocolate pecan brownies. 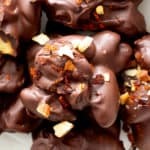 - More Paleo sweet treats (all v, gf, df): almond joy, coffee coconut frappuccino, no bake pecan pie bites, almond butter cups. Absolutely delicious! 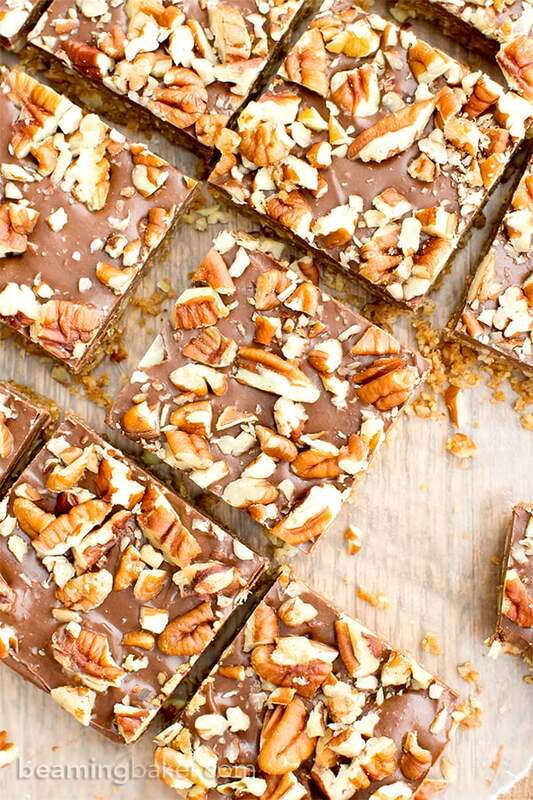 I love the ingredients, the fudgy texture, and the no-bake aspect of these bars. As an added bonus, they are beautiful! I ended up using closer to 1/2 C of pecans to top them off to get the right amount of coverage, but I wouldn’t change anything else about the recipe. So happy you enjoyed them, Kristin. 🙂 Sometimes ya just gotta add more nuts on top! I totally get it. 🙂 Enjoy! Hi Nada, thank you! You can use raisins, or pretty much any other dried fruit of similar texture. 🙂 The flavor of the fruit might affect the bars. Enjoy! these are very good, thanks! This looks amazing! I would love to try them for sure…i have two questions…1st can i make it in 9×13 glass dish? And 2nd one can i freeze them over night? 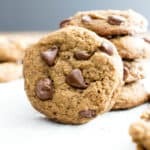 i need to take them on 3h road trip to picnic and i wander if that will be ok to make them the night before and when i came there put them in fridge and use them next day? Hi Noemina, thank you! 9×13 glass dish: yes! Be sure to double the recipe first. Freezing: yes, you can freeze them overnight and take them on the road with you. As long as it’s not too hot, they don’t need to be stored in the fridge. Hope you enjoy! What time of chocolate is paleo approved? I can’t find vegan chocolate near me 🙁 thanks in advance! What chocolate is Paleo approved? I can’t find vegan chocolate around me 🙁 thanks in advance! I have also been using online recipes to cook for Friday night dinners for 6 years and I have never once made any comments. But THIS RECIPE I just had to say something because I think it’s perfect. Chocolatey Junky chemical sugar attack fix? YES YES Yes but without the junky chemical sugars. 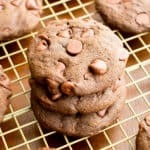 If you have a craving for a chocolatey, rich, junky dessert but your mind, body, or soul (or doctor) tells you to stay away, THIS IS THE PERFECT SUBSTITUTE. I made this for my sister when I was visiting back east a couple of weeks ago and everyone ate it and even wanted seconds. Even the Duncan Hines, chemical junk lovers. it’s that rich and perfectly balanced. Just one note- ADD THE SALT. That to me made the difference. Naomi, I’m SO thrilled to hear that my recipe was such a hit with you and your family! I love that in all your years of kitchen experience, you’ve yet to comment on an online recipe… til NOW! ☺️ Thank you for taking the time to leave your feedback. Hugs!